In my post over the weekend, I took a quick look at Lending Club’s new statistics page. The improved web page offers potential lenders a range of tools to evaluate the overall performance and risk of lending money through Lending Club. In addition to statistics provided by LC, you can also download raw data from the new page and do you own analysis. The information is the raw data is quite comprehensive, including pretty much everything you need in order to perform a thorough analysis, such as borrowed amount, interest rate, loan grade, monthly payment, income, and credit score, etc. If you are the kind of person who like to dig into the raw data and extract valuable information from it, then new statistics page is for you. From there, you can download either the complete loan data from May 2007 to the current month with every piece of information included, or the date just for the funding loans or declined applications. I downloaded the complete data the other day to play with it a little bit. My interest is those loans whose current status is either 31 – 120 days late, or charged off, or default. When I downloaded the data on the 24th, there are a total of 12,150 records in the file. Of them, only 6,922 loans, or about 57% of the total applications, were issued, all others are either being declined for various reasons or still the funding process. For the 6,922 issued loans, 535 of them show the current status as 31 – 120 days late, or charged off, or default. That’s about 7.72% of all issued loans. First I looked at the loan default and the borrower’s credit score. Lending Club requires the borrower to have at last 640 FICO score to be eligible to borrow money. This helps reduce potential loan defaults by setting the requirement high. 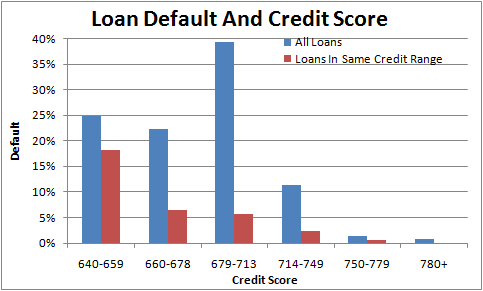 From my analysis, the group with the highest default rate (including loans that that’s 31 – 120 days late, or charged off, or default) is those in the 679 – 713 credit score range, account for nearly 40% of the total default. It should be noted that this group is also the largest borrower group with a total of 2,438 loans. However, if looking only at loans in the same credit score group, the highest default rate is in the group with the lowest credit scores, from 640 to 659, at 18.22%. This explains why the focus in peer-to-peer lending should be on borrowers with good credit. Loans from borrowers with lower scores have better returns, but risk for lending to these people is also significantly higher. I also looked at the borrower’s debt-to-income ratio, which is a measure of a borrower’s debt burden. Using this ratio, you can have an idea whether or not the borrower can live up to his/her obligation of repaying the loan. However, what I found is a little interesting. 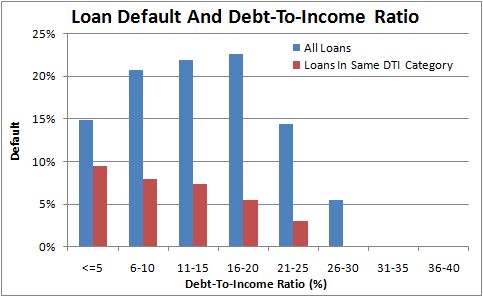 Overall, the loan default rates for DTI ratio from 6% to 20% are roughly the same, at around 20%, of all the loans issued. However, when looking at each particular DTI range, the default rate for DTI ratio below 5% is the highest among all groups at nearly 10%. Usually, the lower the debt-to-income ratio(DTI), the less likely the borrower will be late in making payment, but that’s clearly not the case as the above plot shows. Instead, when borrowers claim they have a higher DTI ratio (above 20%), the default rate for this group as a whole is quite low. BTW, if you are interested in becoming a lender, you can get 25 bonus from Lending Club to start lending right away.